Tibetan Medicine originated many thousands of years before Tibet was an autonomous kingdom. In order to alleviate the suffering of sentient beings, the founder of Yungdrung Bön, the Enlightened Lord Tönpa Shenrap Miwoche, taught medical science directly to his disciples over 18,000 years ago. 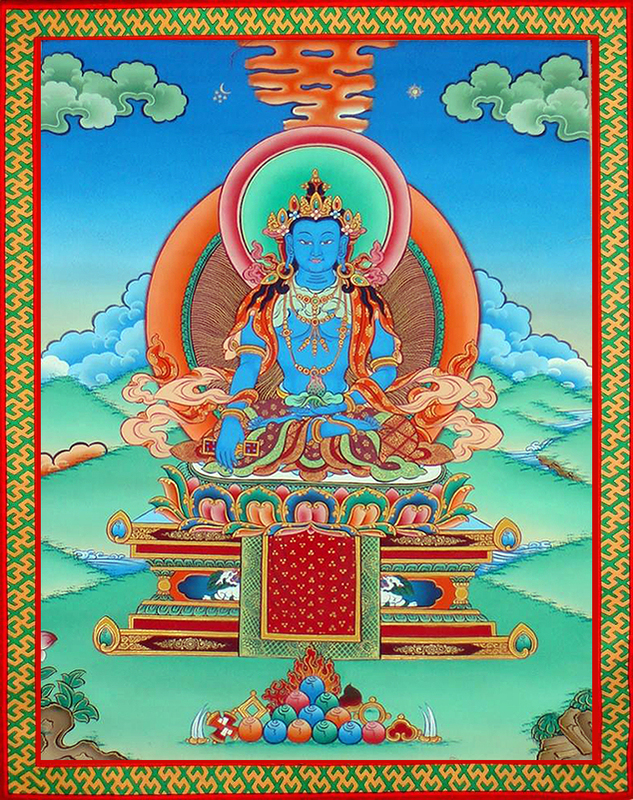 In his emanation as master of this knowledge, Lord Tönpa Shenrap Miwoche is called Sangye Menlha, the Medicine Buddha. This knowledge is considered part of the First Way of Bön. Responsibility for holding this medical lineage was given directly to the Buddha’s own son, Chebu Trishe. This vast medical knowledge was written into a group of texts known as the Bum Zhi, The Four Volumes. These four volumes are: 1) The Root which is the Mind, the Blue Sky Volume, 2) Completely Victorious Medicine, the White Volume, 3) Methods of Diagnosis and Healing, the Mixed Color Volume, and 4) Remedies for Curing Disease, the Black Volume. These texts were translated into the Tibetan language in the 4th century but had to be hidden during the 7th century due to religious persecution of Yungdrung Bön. One method of concealment involved changing the language so as to reflect Buddhist themes. This modified text was renamed the Gyu Zhi. The original Yundrung Bön Bum Zhi was thought to be lost until modern times when the eminent scholar Yongdzin Tenzin Namdak Rinpoche found the text within the Bön Kangyur. Now, it is being widely distributed once again. The studies involved in becoming an Amchi, or Tibetan doctor, are quite difficult and take many years. In addition to knowing the causes and treatments for balance and imbalance within the human body, the Amchi must also devote themselves to spiritual practice and the cultivation of compassion and generosity, understand the intricate relationship between the conditions of the external environment and the internal environment of the patient, and be a master herbalist and pharmacist who gathers, produces and dispenses medicine. Within this medical system, there are a multitude of medical treatments that must be mastered such as moxibustion, massage, cupping, precise physical movements & exercises, preparation of medicinal baths and the use of oral medicines. Some methods have multiple kinds of applications which are determined by the illness being treated. For example, within the category of administering medicine, there are ten different categories: decoctions, powders, pills, medicinal paste, medicinal butter, medicinal ash, concentrates, medicinal wine, gem medicine and herbal combinations. Some of these have multiple variations and many of them take days to months to prepare. The Amchi must determine which method to use and how to properly administer it to the patient. The practice and knowledge of this ancient medical system has remained uninterrupted from the time of Lord Tönpa Shenrap until this very day. Amchi Nyima Samphel Gurung is a doctor, or Amchi, within the Yungdrung Bön Tibetan Medical tradition. In 1968, he was born into a medicine lineage of the Jara clan. This clan had been the personal physicians to the kings of Dzar Dzong, Mustang. For at least nine continuous generations, and perhaps many more, this family have been the physicians for their region. Amchi Nyima first studied medicine with HH Menri Trizen Lungtok Tenpa’i Nyima Rinpoche at Menri Monastery. Returning to his home in Mustang, Nepal, he then studied under the guidance of his father, Dr. Yuthok Tsewang. Following the advice of HE Yongdzin Tenzin Namdak Rinpoche, he went on to study medicine at the Medical School of the Four Tantras in Dhorpatan. In 2001, Amchi Nyima graduated during a ceremony at Triten Norbutse Monastery in Kathmandu, Nepal. At the Medical School of the Four Tantras in Dhorpatan, Nepal, Amchi Nyima studied under Ragshi Tsultrim Sangye. At the conclusion of his studies, this special teacher made him a men gyal, or medicine bag. Traditionally, these bags were used when a doctor traveled or visited patients at their home. The medicine bag would be filled with smaller medicine pouches that contained the various medicinal combinations that might be needed for the patients. Amchi Nyima’s medicine bag is made of an animal hide chosen for its energetic properties to contain the power of the medicines as they are being carried. The outside of the bag has symbols representing the Medicine Buddha and his retinue as well as the sixteen powerful khandro and each of the four directions. Today, it is less and less common for a Tibetan doctor to use one of these traditional medicine bags. 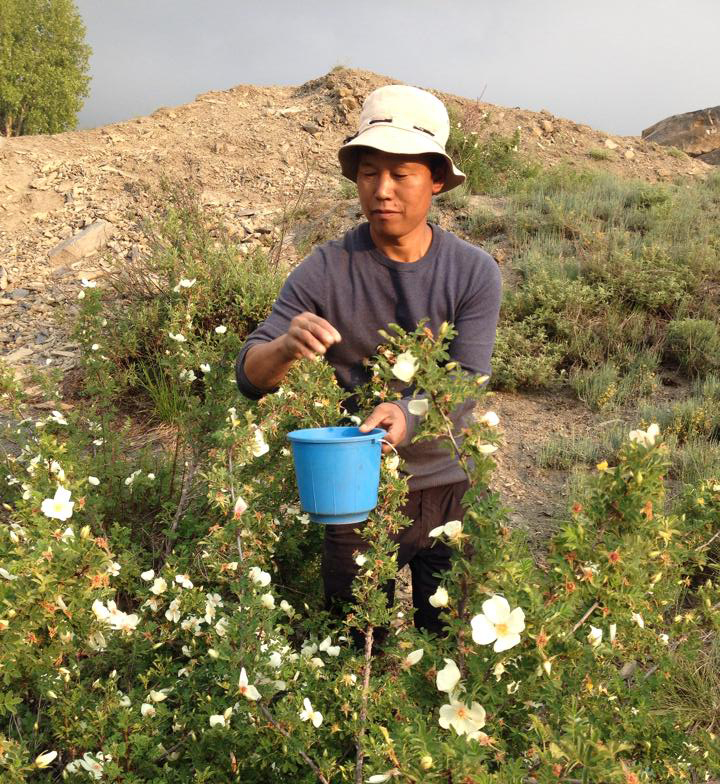 Amchi Nyima currently lives in the village of Muktinath located in Mustang, Nepal. He also frequently travels to both Europe and the United States in order to treat patients. Although he has complete knowledge of the many methods of treatment, his specialty is medical massage known as kunye. When giving a medical massage, Amchi Nyima first generates himself as the Medicine Buddha. At the conclusion of the massage, he dedicates the activity for the benefit of all beings. From his experience treating Westerners, Amchi Nyima has observed that there are a few recurring imbalances caused by the Western lifestyle. The prevalence of raw food such as salad and reliance upon food that has been frozen has contributed to digestive ailments for many people. He has also noticed that many Westerners believe that they are ‘fat’ and therefore either severely restrict food or skip meals entirely. He comments that this is a big problem and causes deep imbalance within the body. In general, he has seen that the tendency to worry and think too much places great stress upon those in Western countries. Preparation for an appointment with Amchi Nyima begins the day before. Patients need to refrain from strong physical exertion, sexual activity, and stressful situations. Also, the patient should not have caffeine such as coffee or strong tea the evening before their appointment. All of these things affect the pulses. After the patient has gone to bed, it is important for them to collect the second urine, usually in the early morning, in a clean, dry, glass container. Ideally, the patient is seen in the morning before eating or drinking anything. However, this is not always possible. Therefore, the patient should at least not drink caffeine and eat very lightly until their appointment. Amchi Nyima relies upon the three techniques for obtaining a diagnosis: 1) Looking, 2) Touching, and 3) Questioning. He will look at the general presentation of the patient including their face, eyes and tongue. He will look at the urine’s color, movement, and qualities. 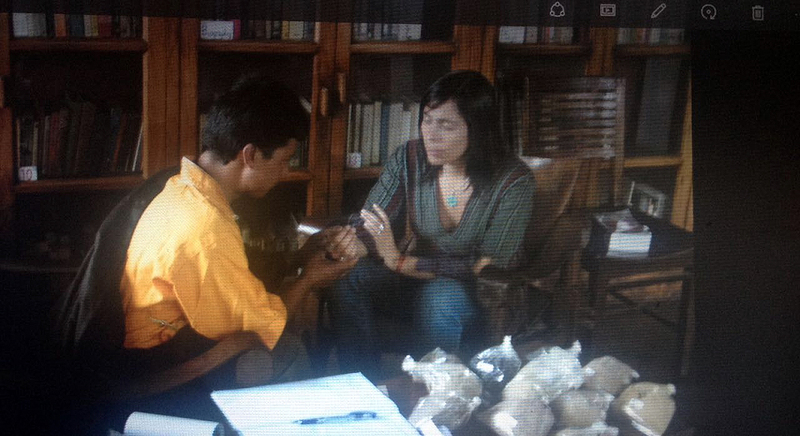 He will touch the patient’s wrists and thereby feel their skin tone, temperature and also read their pulses. during this time, he will also question the patient concerning their concerns and experience of symptoms. The entirety of the patient is taken into consideration including their emotional, mental and spiritual condition as well as their external environment. From this, he is able to ascertain the root cause of illness as well as its branch symptoms. He will then determine a proper course of treatment. Tibetan medicine has no negative side effects and is especially ideal for those patients who are weak and have low vitality. Traditionally, a Tibetan doctor’s home is also his office. Patients arrive at any time of day or night and are treated regardless of whether they are rich or poor. In fact, the services of a Tibetan medical doctor are free and considered part of their practice of compassion. However, the community understands the importance of supporting the doctor and continuing his ability to serve. Therefore, patients offer whatever they are able in exchange for medical treatment. In modern times however, Amchis have needed to adapt to the Western idea of setting a fee for service due to the growing dependence upon a monetary economy as well as the increase of Western patients who are unaware of the understanding between the doctor and the community. Also, Westerners traveling in Nepal who are in need of medical attention have no knowledge of where to find the local doctor or how to receive treatment. These are some of the reasons that Amchi Nyima has begun plans for a medical clinic in his village, The Ancient Bumzhi Medical Collection & Processing Center. The clinic will also cultivate medicinal plants that are in danger of being lost through over harvesting by business interests. In this way, Amchi Nyima is working to preserve this ancient medical tradition for generations to come. Posted on April 17, 2016, in Nepal, Tibetan Culture & History, Tibetan Medicine, Uncategorized. Bookmark the permalink. 2 Comments. We were very happy to be a sponsor and host for Yeshe Donden, the Dalai Lama’s personal physician. This was when Joel andI lived in Boston. I asked him about my weight, as mentioned in the above document. He laughed and said I was fine, just right. I have been on a never ending diet since I was 12. I actually didn’t believe Yeshe Donden about my weight, and so fussed about for most of my 77 years. But now I accept that if I eat clean, organic vegetables, I will live as long as I am supposed to. Thanks so much for this very interesting article.